On January 9th, Thank a Cop! Chuck Canterbury, National President of the Fraternal Order of Police, knows that a little thanks can go along way which is why the FOP is helping to spread the word about National Law Enforcement Appreciation Day this year. The FOP urges its members, families and friends to “back the blue” as well as visit and like the National Law Enforcement Appreciation Day’s Facebook page. How can you show your appreciation? 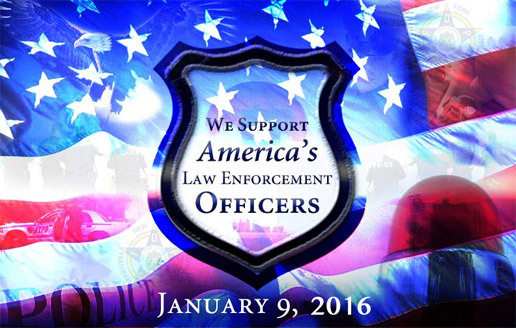 Change your profile picture on social media to support law enforcement. See a police officer? Thank a police officer. Share a positive story about a law enforcement experience on social media. Participate in Project Blue Light. Proudly display your blue light in support of law enforcement. Organize an event or rally in support of your law enforcement officers. Advertise your support through local media outlets or billboards. Post the following public service announcement to your law enforcement’s webpage or social media pages (https://www.youtube.com/watch?v=uK-0UvwasUc). The Fraternal Order of Police is the largest law enforcement labor organization in the United States, with more than 330,000 members.